In this current “pre-detection” era it can be difficult to convince those who are not overly familiar with the theory of general relativity that gravitational waves really do exist. Fortunately, the Hulse-Taylor Pulsar (PSR 1913+16) provides firm evidence of a binary system actually emitting gravitational waves! In 1974 Russell Hulse and Joseph Taylor discovered the signal of a pulsar using the Arecibo radio telescope. The pulsar had a period of 59 milliseconds. Further measurements showed that the orbital period varied in a repetitive manner over a period of 7.75 hours. This meant the the pulsar must be in orbit with another star. Over the years the period of the pulsar has been measured to high accuracy. General relativity tells us that a binary system will emit energy as gravitational waves and eventually the two objects will inspiral towards each other and merge. As the system evolves towards this merger the period of the orbit will gradually decrease. The figure (from Weisberg and Taylor, 2004) shows the cumulative shift of periastron time for PSR 1913+16. This shows the decrease of the orbital period as the two stars spiral together. 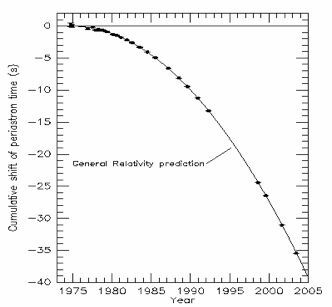 Although the measured shift is only 40 seconds over 30 years, it has been very accurately measured and agrees precisely with the predictions from Einstein’s theory of General Relativity. The observation is regarded as indirect proof of the existence of gravitational waves. Indeed, the Hulse-Tayor pulsar is deemed so significant that in 1993 its discoverers were awarded the Nobel prize for their work.